As an artist and African American man, Pecou considers himself immersed in the question he’s exploring. 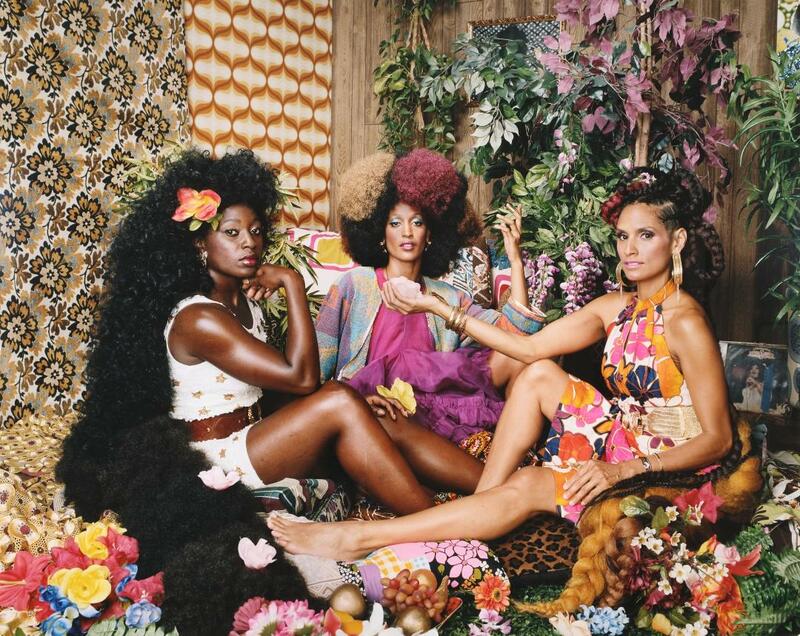 He’s found personal depth in the African diaspora religious practice of Ifá, and the work in Do or Die is designed to demonstrate how a new and unsuspected identity already rests beneath the shallow surfaces encouraged or imposed upon African Americans by American culture and society. Pecou introduces the idea in a video. Elsewhere in this striking exhibition, he shows us via various media and dramatic circumstances. The work in the exhibition can be viewed here, on a page from the original 2016 exhibition. Because the second part of Alfred Conteh’s The Sweet Spot — at Clark Atlanta University Art Museum through May 31 — was still in the early days of installation, I can’t pretend to do justice to this two-part, yearlong retrospective. 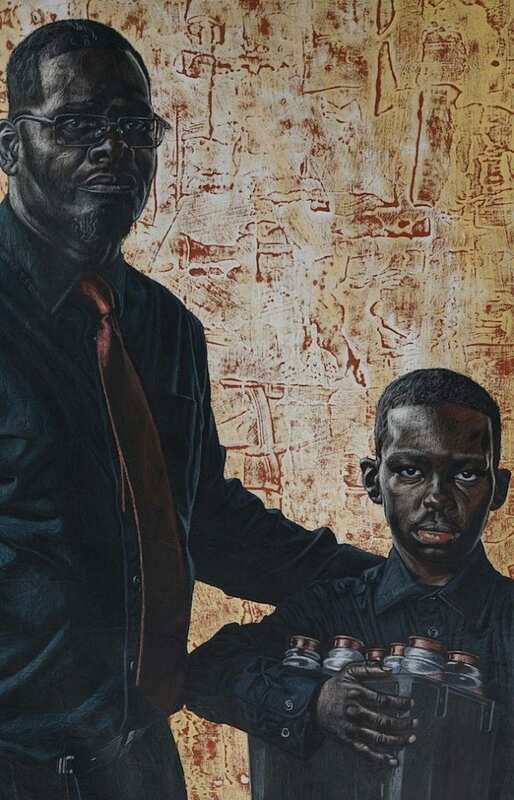 Conteh, an extraordinary sculptor, painter and mixed-media artist, uses portraiture and urbanscapes to portray the dimensions of African American life in Atlanta, a city that has long been a magnet for African Americans under historical circumstances too complex to summarize here or in a review. Richard Thomas Scott’s The Abolitionist, oil on canvas (above). 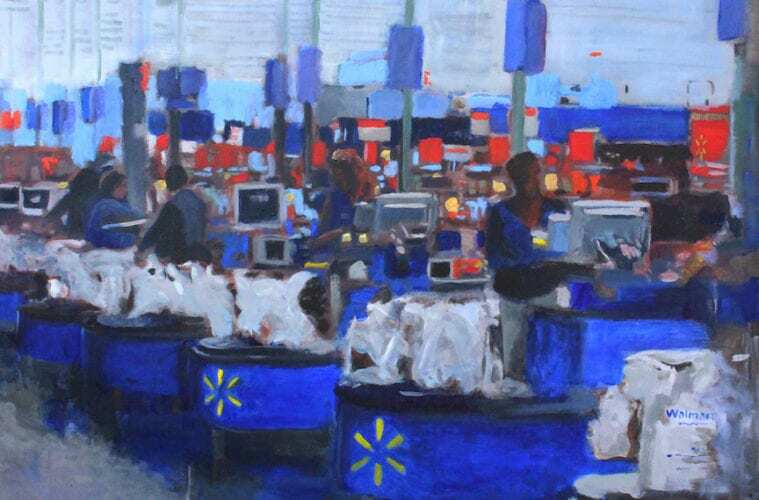 Top: Brendan O’Connell’s Wal-Mart, also oil on canvas. Scott, who’s been a studio assistant for pop-culture artist Jeff Koons and figurative painter Odd Nerdrum, seems to share the latter’s taste for unconventional Old Master technique and the former’s capacity for in-your-face confrontation. Scott was shocked by experiencing a school shooting in Conyers in 1999, on the last day of his senior year in high school. He later was stunned when he realized his education had misrepresented the primary causes of the American Civil War and that slavery began seven years after Dutch traders landed African slaves in Jamestown. 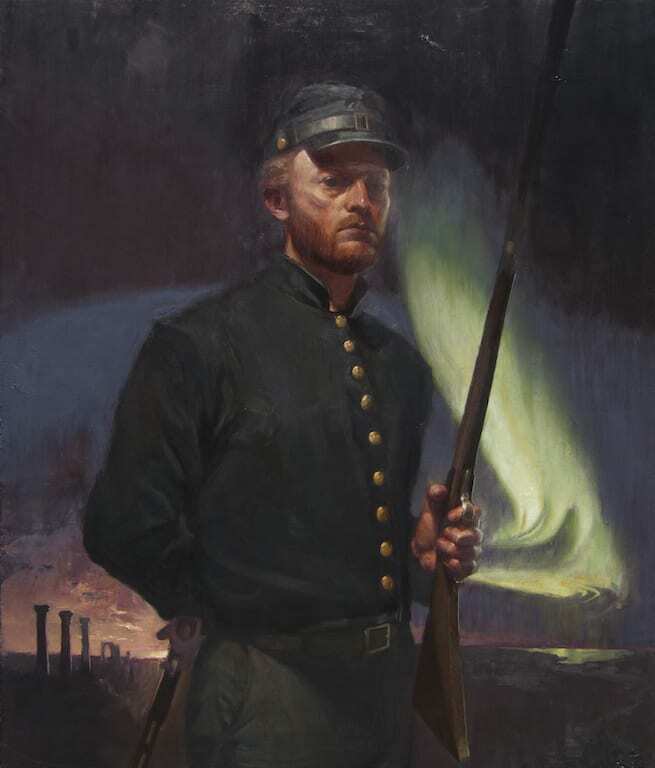 As a result, Scott dressed as a Union soldier in frighteningly realistic Civil War reenactments in Richmond, Virginia, and painted a formal portrait of himself as an abolitionist. He also portrayed African Americans in allegorical paintings that, in today’s emotionally charged atmosphere, will likely elicit discomfort from more than one direction. O’Connell’s examination of Wal-Mart’s consequential place in American life might seem bland by comparison. Not so. His studies of shoppers in front of stacks of products share the conviction as Scott puts it, that “human suffering is comprehensible to all of our species, and through empathy we may know the hearts of others if not their experiences. And through that, we might reach them.” In one way or another, we all operate in degrees of unawareness and ignorance. O’Connell’s portraits of sports figures Colin Kaepernick, LeBron James, Muhammad Ali and Hank Aaron, when placed in proximity to Scott’s bluntly controversial self-portrait, create a political statement so multilayered that I’m not foolish enough to try to elucidate it. I suspect others will. 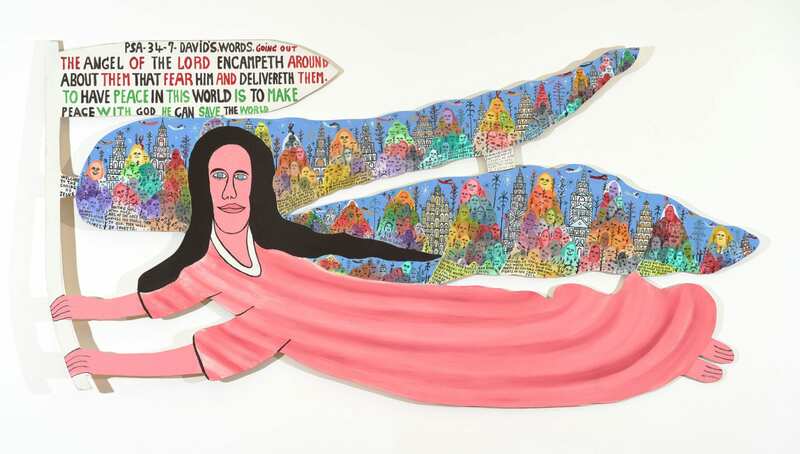 It’s been said that the wondrous work of self-taught painter Harry Underwood, a former construction worker, combines Henry Darger’s figuration with Howard Finster’s love of text. 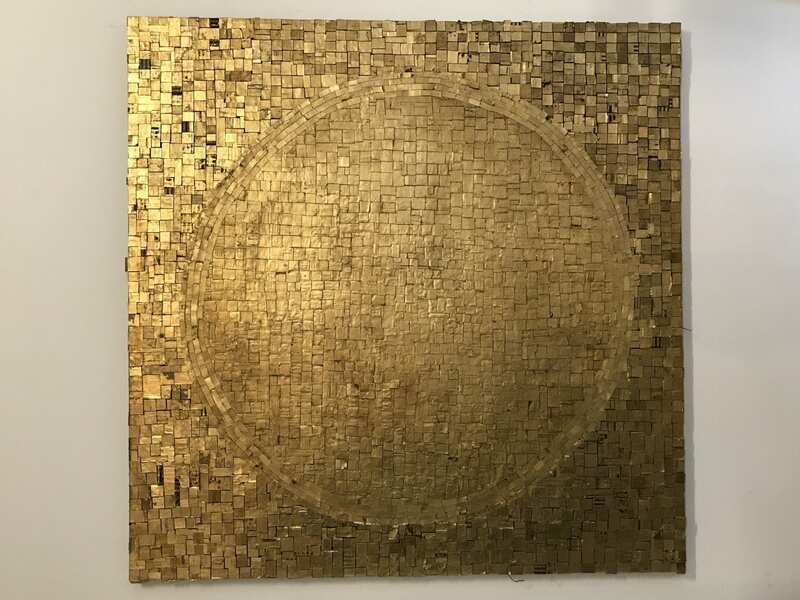 However, the work in the Nashville artist’s Red-Letter Days at Decatur’s Different Trains Gallery through March 2, will not likely be confused with either Darger’s or Finster’s. Few would picture Finster making the epistemological observation in the painting Intermission that “meaning is a dynamic of uncertainty,” complemented by the offhand remark that “inertia is an enemy of the yo-yo.” The same holds true for Disgraced Americans, in which Underwood captions a service station labeled “American” with a pithy note that says “the worshipful industry of the societal world. Disgraced by fame and by cynicism Nov 8, 2016.” Despite drawing (literally) from similar pop-culture visual sources, this is a long way from Darger’s mythos. 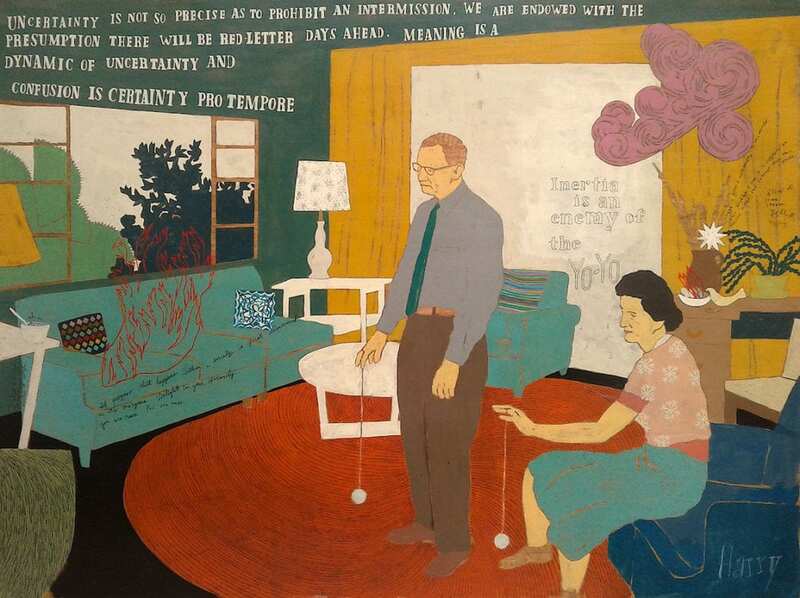 Underwood’s art is about the condition of contemporary America, made by a member of the fabled white working-class, from positions that are uniquely Underwood’s own. Vivian Maier: The Color Work, at Buckhead’s Lumière Gallery through March 22, retells the well-known story of an outsider who worked largely as a nanny so she could document the world around her in photographs. Her work earned her posthumous fame. Maier’s color photography, mostly done before the genre became museum worthy, demonstrates a keen awareness for striking juxtapositions of palette in the real world — life imitating the tricks of painting as a spot of color catches her attention, for example. The color work continues Maier’s remarkable capacity for capturing the personalities of the people so often seen in her black-and-white images. Lumière’s Maier show features more than 30 prints from the John Maloof Collection. They demonstrate occasional repetitions of theme and a visual strategy that should leave Maier fans eager to acquire the HarperCollins book containing a larger selection of her color work. 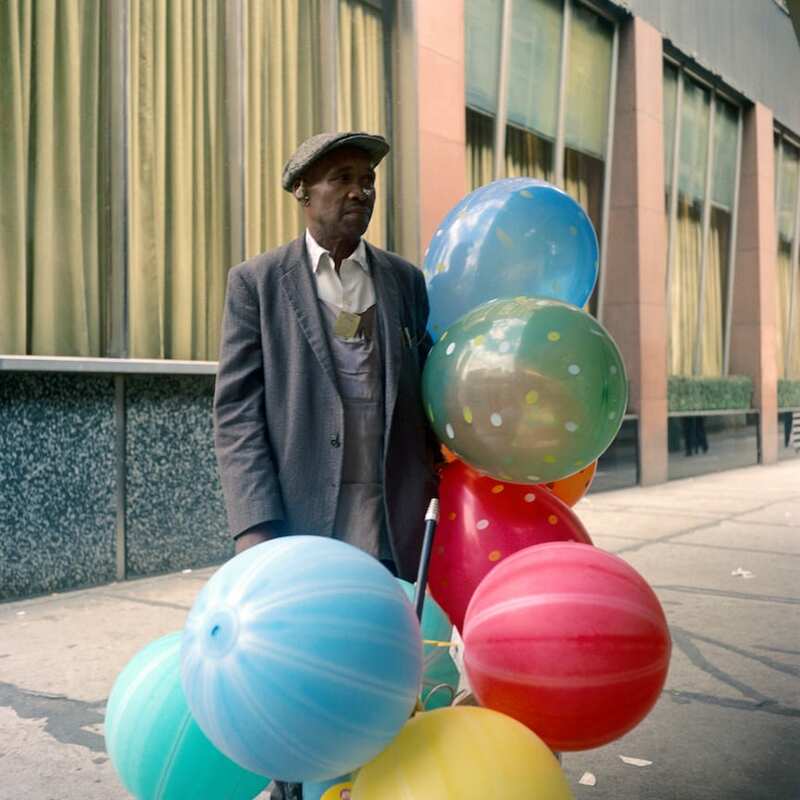 Two caught my eye: a 1971 photo of an African American man in Chicago posing with brightly colored balloons and a 1966 image of a young white man posed with similar balloons but in more subdued colors and a less urban setting. I don’t wish to extract any symbolic implications from this duo, but the possibly unintentional combination makes an excellent place at which to end this notebook.